Pumpkins and gourds are common additions to autumn arrangements. These squash-like fruit can hold flowers, fill out an arrangement, provide a home for candles or otherwise complete a tablescape. Before you begin working with pumpkins and gourds refresh your knowledge on carving pumpkins and hollowing gourds as well as polishing and painting them both. Also brush up on what to do with rotting pumpkins and gourds so that you know when to dispose of them. Selecting a pumpkin large enough and firm enough for your intentions. Ensuring that your pumpkin can stand up on it’s own on a flat surface. Cleaning the pumpkin with water and a soft cloth to remove dirt and grime. Drawing or tracing your intended designs onto the pumpkin. Cutting a circle around the stem to create a “cap” for the pumpkin. Scraping away any pulp or seeds hanging from the cap. Scooping all pulp and seeds from inside the pumpkin. Scraping on the pumpkin skin to create your design in relief. Smoothing a layer of petroleum jelly over the cut areas to preserve the pumpkin. 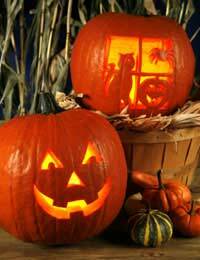 Lighting a small votive, tea light candle or torch in your pumpkin as desired. Hollowing out gourds renders them ready for many types of seasonal uses, from acting as soup bowls on a seasonal table to displaying pot pourri to housing small candles. Simply select a gourd which can stand on its own, clean off any debris with water and a cloth, then cut off the top and scoop out the insides. Selecting a number of similarly sized or shaped gourds will allow you to create a line or cluster which you might choose to showcase by elevating some on small pedestals for visual interest. When you work with pumpkins and gourds which you will not cut, make sure that you polish them to a high sheen to make the most of them in a display. Carefully select strong pumpkins and gourds which have no soft spots, mould or holes. Clean your specimens with water with a small amount of bleach mixed in. Apply small dabs of petroleum jelly all over and rub into the flesh with a soft cloth. A light coating of liquid floor cleaner or wax applied with a damp cloth should also work to keep pumpkins and gourds in a high shine throughout the season. Clean and dry your selected items. Select a well ventilated area for your project. Spread newspaper or parchment paper on your work surface. Apply a multi-purpose sealer to everything you plan to paint. Draw on patterns with a permanent marker as desired. Create stripe patterns by applying tape to your pumpkins and gourds. Paint or spray paint as desired. Let dry before painting further designs or patterns. Apply a sealer to finished items. Glue on buttons, sequins, stickers and foam shapes as desired. Pumpkins and gourds are fruits, and as such their life-cycles include rotting. Watch for black or soft spots developing on them, flies hovering near them, small insects or animals getting inside them or eating them, or a smell emanating from them. As soon as you spot a rotting pumpkin or gourd remove it from your display to avoid unpleasant sights, odours or potentially spreading anything to the other elements of your arrangements. Pumpkins and gourds are versatile fruit for use in autumn arrangements. Before deciding to add these elements to your displays make sure you know how to carve pumpkins and hollow out gourds as well as how to shine, paint and spot rotting in both.